I'd like to share a picture of my Citsuma Prague which is the most bizarre citrus I have. It has grown pretty well but it seems it wants to grow in all directions but upwards. If I let it grow it would be much wider than tall. I know Ilya has one, too. I'd love to see some pictures. That's neat. I wish I had a citsuma Prague. Would be nice to have a tree from , as grandma says, " the old country". The growth habit looks a lot like my citrange seedlings. You have very nice specimen. I have this Citsuma in the ground since 2004, but it is grafted on very weak rootstock and has not grown much. 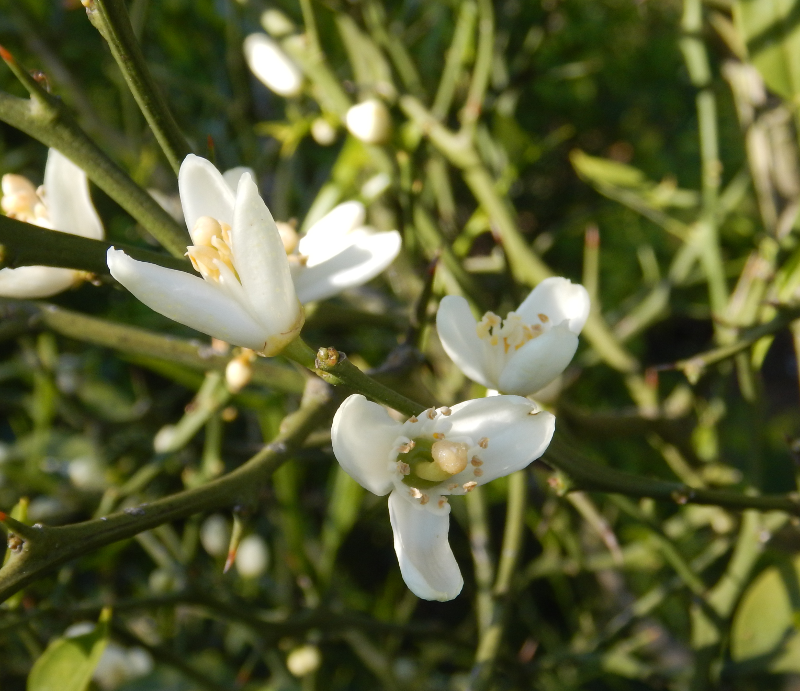 Never damaged, but flowering is very sporadic and fruits rapidly abort. Last year I regrafted it on high stem of very strong poncirus, hope it will finally give some fruits. Sylvain in Dordogne have very nice plant, almost 2 meters high , producing sweet fruits of very good quality. 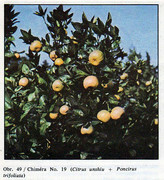 Ilya,11 the Satsuma Prague is a cross between the Citsuma unshiu X Poncirus trifoliata correct? Its origin is not yet clear. Leaves are a mixture of bi- tri- or monofoliates. The fruits are almost satsuma like, no poncirus smell or taste. 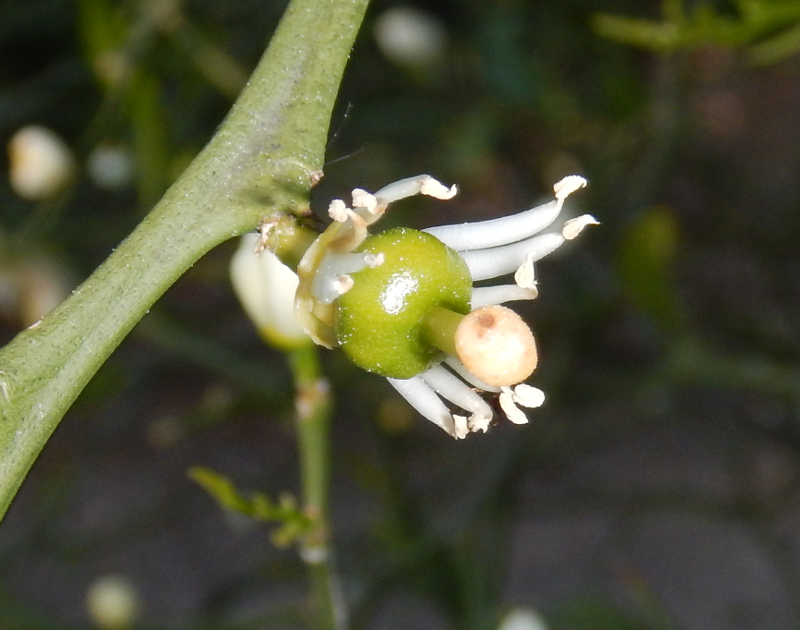 There is suspicion that it is a chimera between poncirus and satsuma, but strangely enough even stems and leaves do not have odor or taste of poncirus. 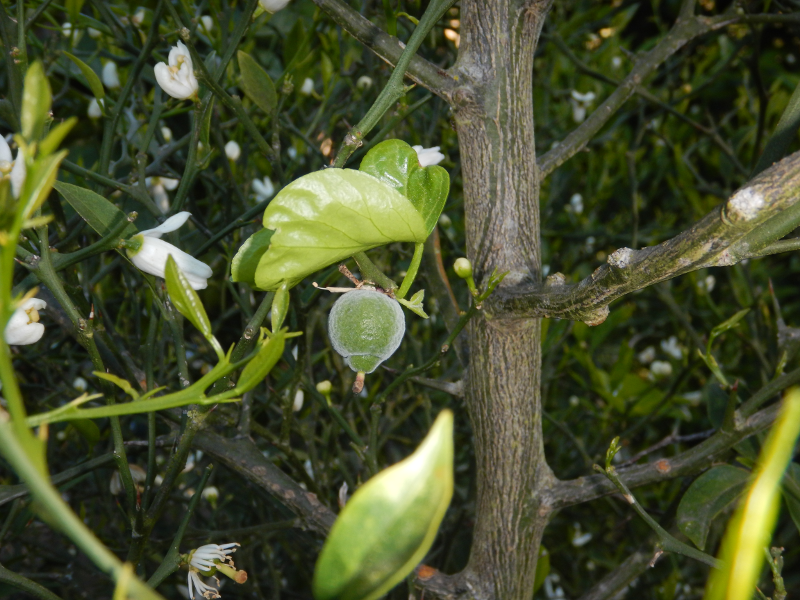 Scientists in Brno show that the nuclei from its cells have homogeneous DNA content, that does not definitely proves an absence of chimerism , but points more to the hybrid origin of this citrus. On the other hand, Roberto from Wien observed an emergence of poncirus like branch distantly from grafting point. It could be some second generation poncirus-satsuma hybrid with unstable genome, but no definite proof for this exists for the moment. Interesting, to bad there is no supplier of the tree in the USA. Thank you so much for the information, Ilya. My plant is a strong grower but I would still like to graft it onto a taller poncirus because I like tree forms better. I will let it grow until it flowers and try to graft it then. I need more time anyway because my poncirus rootstocks are still very small since I have to grown them from seed. I have a strong feeling, that mrtexas showed at old forum (few years ago) plant, which most likely is Citsuma Prague and he propagated it as great satsuma like mandarin with great hardiness. I looked up chimera and looks like it is two different species fused together. Do we call this citrandarin chimera instead of hybrid because it has a good mandarin quality fruit on a trifoliata tree, whearas most trifoliate hybrids have a tree body and fruit that is a mix or blending of the two parent trees? Well, Ilya said that the homogenous dna makes it rather unlikely to be a chimera but I am no expert. It is believed for a long time to be a chimera, but its origin is very obscure. It is either originated in Abkhazia region of the USSR or in Prague, Czechoslovakia. 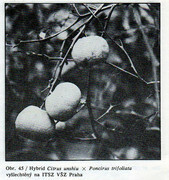 In USSR several attempts were made to produce poncirus/citrus chimera by the induction and subsequent regeneration of massive callus at the grafting point. By this, they believed to produce plants containing cells from two species (chimeras). Most of such plants are unstable, giving branches of pure species, but occasionally a stable, so called periclinal chimera can be produced. In the recent study Czech scientists isolated the cell nuclei from this plant, stained their genetic material (DNA) by fluorescent die and determined the intensity of fluorescence signal from individual nuclei. Since the genome of different citruses is slightly different in size, they hopped to see two peaks of fluorescent intensity if it is satsuma/poncirus chimera. They observed only one, so it is either not a chimera but a hybrid or chimera between poncirus with some hybrid having approximately the same genome size as poncirus. I guess only molecular markers can definitely resolve the origin of this very strange plant. According to Snek, there are three hybrids/chimeras known in former Czechoslovakia. One is hybrid Unshiu x Poncirus selected by professor Pospisil in seventies, the plant is still in greenhouse of university in Prague. Second one is Chimere no.19 (unshiu poncirus) from USSR. (from the book „Pěstování citrusů“, c. SZN 1987, Ing. Stanislav Hušák, CSc., Doc.Ing. Vladimír Táborský, CSc., Prof. Ing. Pavel Valíček, DrSc. And third one: hybrid P.t. X Unshiu from USSR too. 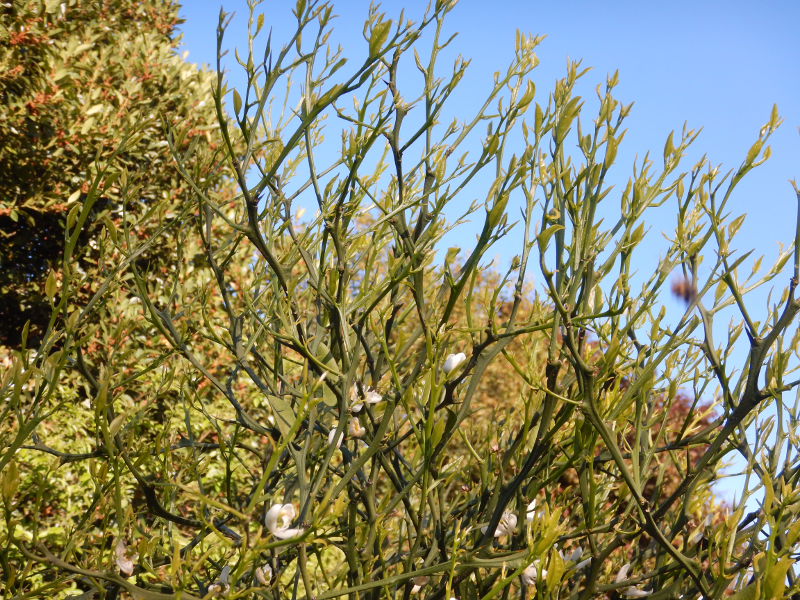 Have you seen the recent photos of this surviving plant? For me the old black and white picture of it looks very similiar to what I have in the garden. 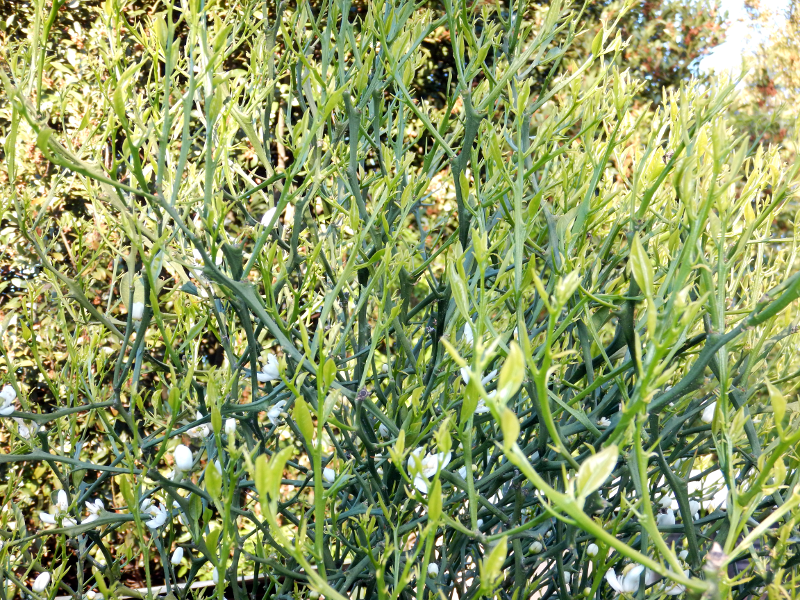 On other hand, the picture from Riverside is also similiar, although their plant is described as chimera from Abkhazia. It has grown pretty well but it seems it wants to grow in all directions but upwards. After few years the shoots go strait to the sky. The tallest is now 2.50m. The second one is about 2m high and last year I made a third that is a little less than 2m. The last one is an over-graft on a '5 stars' grafted on PT. It is very vigorous. Leaves are a mixture of bi- tri- or monofoliates. Like shown on the Ilya11's picture bifoliate and trifoliates are very rare. Most are deformed monofoliates. Not 'almost', they are pure satsuma fruits. For me there is no doubt, it is a chimera. This spring one very big flower appeared just at the same time than the poncirus flowers. Looking exactly the same. The Prague chimeras bloom nearly one month later with small flowers. The fruitlet issued from this flower is already big and have a velvet skin. Now we know that the poncirus that made the chimera is of the large flowers kind. Last year I had one seed from the fruits (the first one). 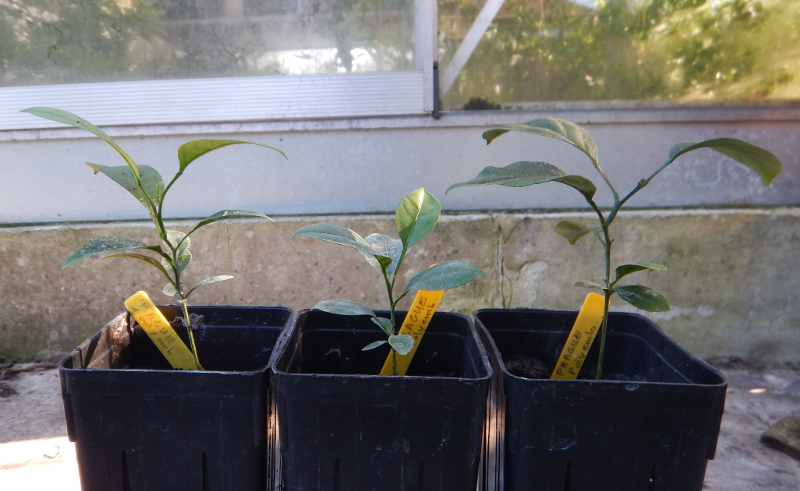 It gave three seedlings that are pure mandarins. I don't think so. The fruits are very different. This one looks more like an orange than like a mandarin. Have you been able to germinate its seeds? Yes, I have three seedlings growing. Sylvain, would you have a picture of your plant and fruit? Is it possible to see them, please? I came back home late and the light isn't good. Does someone dare to say it is not a chimera? Silvain it is sure easy to see the Poncirus parentage in your tree. Your tree is huge and magnificent. From what you presented it is clear it is a chimera between poncirus and pure satsuma. Where you did got the budwood from? It was from Petr Broza. At this time (2008/2009) we were only three (with B. Voss who found it) to have it. Ąll what i know about this case, is that snek thinks, that Voss during his visit in greenhouse in university of Prague dig out and took with him plant that was not the plant snek calls hybrid Unshiu x Poncirus, selected by professor Pospisil, but Chimere no.19 (unshiu poncirus) from USSR. Voss gave it name citsuma Prague, but it is not the citsuma Prague which for example Snek and some others have in their collections. Chimere no.19 , grows upright, while so called hybrid grows more like flying dragon, or willow.